Someone asked me the other day whether the whole food, plant based (W.F.P.B.) diet that M.E.T.I. is promoting can help reverse heart disease. The answer is a loud YES. To emphasize this point I will relate to you the story of Dr. Caldwell Esselstyn, who was for nearly forty years one of the senior surgeons at the famous Cleveland Clinic in Cleveland, Ohio, U.S.A. It was here that the first cardiac bypass surgery was performed in 1967 to help patients, who had suffered a heart attack due to severe clogging and obstruction of the arteries to the heart, called the coronary arteries. In the mid-eighties, Dr Esselstyn became increasingly unhappy with the way heart attack patients were being treated. He felt that the bypass surgery, while saving lives, didn’t treat the root cause of the disease, which in his opinion was that the patients were eating the unhealthy ‘standard American diet’ (SAD) high in fats and based on animal products. He had come to this conclusion when noting that in many countries around the world heart disease (and for that matter also diabetes and other chronic degenerative diseases) was rare. In these countries, invariably the people were eating mostly vegetarian or plant-based diets. Dr Esselstyn opened the Wellness Clinic on the grounds of the Cleveland Clinic and persuaded his colleagues to send those patients to his Clinic that could not be treated any further with surgery and were considered ‘terminally ill’. In his best-selling book ‘Prevent and Reverse Heart Disease’, he reports on the progress of twenty-four such patients that had been told by their doctors that they only had about 3 months left to live. All of them adopted the W.F.P.B. nutrition programme prescribed by Dr Esselstyn. When his book was published in 2007, surprisingly, 23 of the 24 patients were still alive 20 years after they had started the W.F.P.B. diet! How was this possible? As he explains, in a matter of days the blood supply to the heart muscle is improved when one switches from the high fat, animal based diet to the low fat, whole food plant based diet. M.E.T.I’s experience with treating patients with heart failure has been gratifying. In our Health Column of 4 November 2017, we published the testimonial of Afioga Maiava Taua Letoga, who, by strictly following the W.F.P.B. diet reversed his severe heart failure in a matter of weeks. 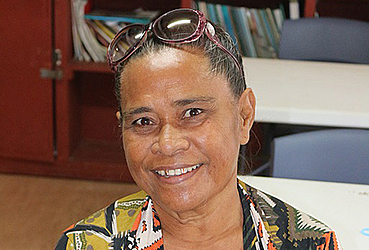 In today’s Column we are happy to report on another such patient: Mrs. Christina Robert from Tauoo, Faleasiu. In her own words she explains how, by strictly following the W.F.P.B. diet, she regained her health in a matter of weeks. The value of the W.F.P.B. diet is based on two important factors: the first one, explained above is that such diet allows tiny arteries feeding the muscles throughout the heart to open up causing an increased blood supply to the heart. This will take place in a matter of days. Furthermore, the W.F.P.B. diet boosts the strength of those immune cells charged with cleaning up the inside of the arteries –unclogging the arteries. In this way –but over a longer period of time, taking months, even years – the larger blood vessels to the heart, by being cleaned out, will deliver more blood to the heart muscle. Both mechanisms ensure that even advanced heart disease can be reversed, provided the patient sticks faithfully to the WFPB diet. It is worthwhile to quote Dr Esselstyn’s famous words: “Heart disease is a ‘paper tiger’ that should never be allowed to exist…” If any of you, who read these words are suffering from heart disease, whether high blood pressure, a recent heart attack or heart failure or who have relatives or friends suffering from these conditions: please come or bring them to METI’s Motootua Clinic to learn more about the WFPB diet that reverses heart disease in a matter of weeks. The Clinic is located in the Old Acute 7 ward at Motootua, downstairs from the present Dental Clinic. The Clinic is open on weekdays from 8 am till 4 pm. My name is Christina Robert from Tauoo Faleasi’u. I am a widow of 64 years old. I was Hypertensive for 11 years and started taking pills from that time. In 2010 I developed Heart Failure and needed additional drugs. Starting from that time until last year I felt weak in my body, not only that but also I’ve got back pain. In December 2017, I thought that was my last year on earth, I was admitted in Motootua Hospital for two weeks because of my Heart Failure. I was discharged and the Doctor prescribed further drugs. It was hard for me to take these pills as they caused stomach upset. When I came for my next appointment and I explained all this the doctor advised me to go to METI’s Clinic. The next day, I sent my son to see them. When he came back, he told me about the (whole food, plant based) diet. On the second week of January this year METI started their program called Nutrition Advice, and I started my diet from that time till now. After two weeks on the diet, I stopped all my pills on my own decision as I felt great. I am very interesting in this type of food. Now I am back to my usual duties, attend the women’s committee, weaving mats, because my blood pressure has become normal again and all the pain has gone, and especially my heart is now OK. Special thanks to my family support my sons and daughters- in-law, without their support I can’t do anything. If you suffer from all these Non Communicable Disease and you’re sick and tired of taking pills, go and see METI for their help. Last but not the least thank you very much METI for your help.